You clean up nicely, La Grange, IL! Hurrah! The kids are off to school, and fall is on the way. Time to turn our attention to fall cleanup. It doesn’t have to be drudgery, however. Let’s look at some ways to make it easy as (apple) pie! It’s funny to start thinking about winter now, but that’s what fall cleanup is all about. Clean up now and avoid winter problems in the home and in the yard. Avoid winter problems, and you will have an easy time when you’re ready for spring cleaning! According to The Old Farmer’s Almanac, the first frost date for La Grange, IL is October 22nd, and we can expect our first snow by the second week of November, so it’s time to get ready. Good news! Horticulturists aren’t recommending the hard slash and rake method any more! While you should still clean up a bit, be sure to leave a little debris here an there for the bees, butterflies, and ladybugs to find a place to winter over. And if you have a lot of native plants growing, well, they are native for a reason–because they naturally flourish in our climate. Let’s start with those leaves and weeds. Too many leaves will suffocate your lawn, so you will want to rake most of them up and pull the weeds. Weeds should come up easier these days as they are towards the end of their life cycle and not hanging on to the earth as hard as they so when they are trying to grow. If you have a compost bin, everything can go there to break down for next spring’s planting mixes. If not, The Village of La Grange has a great fall leaf removal program. Between the first week of October and the week just before Thanksgiving, all you have to do is rake them to the curb (don’t bag them), and the Public Works Department will pick them up! If you weren’t so great about deadheading your flowers this year, now is the time to do it. Get out your pruning shears and snip off the dead flowers on your annuals and perennials. And while you’re at it, divide and separate the bulbs that are no longer flowering. The more room they have to grow in the spring, the more flowers you will have. Trim up the roses, clean up their beds, and put down some fresh mulch. Then get out the bigger branch cutters. While you shouldn’t cut your established bushes and shrubs to the ground, a light haircut will help them save energy in the winter and flourish in the spring. The same holds true for your trees. If you notice any branches that might present danger under heavy snow, be sure to remove them or have a professional do it for you. Tilling your vegetable garden is optional. Some experts say you should do it because you mix in organic matter (your dead plants and veggies that didn’t make it to the kitchen), aerate the soil, kill weeds, and make for easier planting in the spring. While all of these things are true, many experts are not saying tilling isn’t as important as we once thought. The organic matter is in there already as plant roots; worms and beetles do a fine job of aerating the soil; and weeds will still grow in the spring as their seeds are deep in the ground. So you get to skip it if you want to! Your lawn–fall is the perfect season to fertilize, aerate, and cut it short. After a long, hot summer, the grass in your lawn needs to rest and recover. Fertilizer gives the turf below a good shot of much-needed nitrogen and potassium and helps grass start growing and storing nutrients for the winter. Did you love your lawn a little too much this summer? Barbecues and birthday parties can compact the soil your grass is trying to grow in. Aeration opens up the soil so your grass roots can get more water and nutrients. Do it yourself or call in a service. Lastly, just before the snow flies, give your grass one last mow on a fairly close setting. This gives your grass some air and reduces the chances of mold developing in the fall rains and winter snows. Speaking of winter, make sure you don’t end up with split hoses and pipes. If you have a sprinkler system, be sure to call a service to “winterize” it. They’ll shut the water off to the system and force air through the pipes so they won’t freeze and break in the deep freeze of winter. You will also want to drain any water features and make sure there isn’t any water in those pipes or hoses. And don’t forget about your hoses. Disconnect them from the outdoor spigot and hang them over the fence to drain. Then coil them up and store them in a shed or closet. Lastly, be sure to clean and store your garden tools. 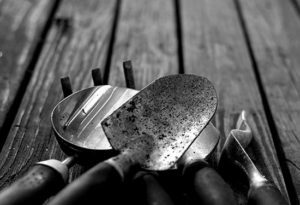 You don’t want a rusty shovel or rake when you are ready to start your spring gardening projects! You know what needs to happen inside your home, especially if you have started any sort of decluttering project recently. But there are two areas outside of your home you should definitely not neglect–gutters and decks. Gutters: Everyone agrees–gutters, especially clean ones–protect your home from water damage. Keeping your gutters clean protects the foundation of your home, prevents any staining from water pouring out of places it shouldn’t, and lessens cracking concrete around your home. So, after the leaves have stopped falling, be sure to clean them. Hiring a service is often times not that expensive and can save you time and potential trips to the emergency room. You can, of course, clean them yourself if you are careful on the ladder and wear sturdy work gloves to avoid injuries and insect bites. A small spade works well to dig out leafy mush. Wooden decks: Break out the power washer or rent one from a nearby hardware store and power wash your deck. This is also a great time to apply a fresh coat of stain to protect the wood for winter. Just be sure not to use too high of a setting on the power washer–you don’t want to damage the wood. 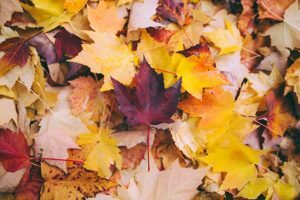 Whether you are thinking of selling or you trying to build equity in your home, fall clean up is one of the best ways to make sure your home always looks its best. And it’s not just about beauty, either–fall clean up will prevent any nasty surprises each year and for many years to come.